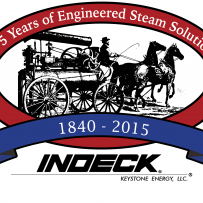 Erie, PA… Indeck Keystone Energy, LLC, a division of the Indeck Group of Companies celebrated 175 years of steam advancement and boiler designs during the Electric Power Expo in Rosemont, Illinois. Indeck is a worldwide leader in providing power steam generation equipment to power plants, petrochemical, refineries, steel mills, processing plants, pulp industry and utilities. The Indeck Group of Companies has over 5,000 installations in 50 countries. 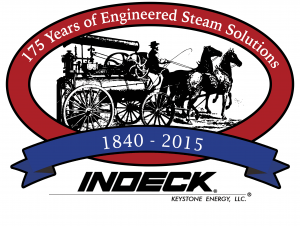 Since 1840, many industries including utilities have turned to the Indeck brands (Erie City Iron Works, Zurn Energy Division, Aalborg Industries, Volcano, International Boiler Works, Keystone Energy) for efficient steam solutions. Indeck Keystone traces its roots to 1840 as the Presque Isle Foundry, an early manufacturer of boilers and steam engines. When Erie became an incorporated city, the company changed its name to Erie City Iron Works. In 1859, Erie City Iron Works provided the steam generator and engine to drill the world’s first oil well in Titusville, Pennsylvania. In 1880 Erie City Iron Works was recognized as the largest boiler manufacturer in the United States. As the 20th century emerged and industrialization of the United States progressed so did the boiler designs of Erie City Iron Works which added watertube boilers burning coal, gas and oil during this growth period. The company changed hands during the 20th century and became known as Zurn Energy Division, Aalborg Industries and Keystone Energy leading to the Indeck Group acquisition and naming the company Indeck Keystone Energy LLC in 2004. Indeck is proud to be engineering and manufacturing boilers that provide excellent reliability, availability and maintainability for industrial and commercial customers worldwide. Indeck Keystone Energy LLC designs and builds boilers to burn virtually any fuel to produce steam efficiently in a safe and reliable manner. Indeck Keystone also maintains a comprehensive OEM spare parts inventory and 24-hour availability to facilitate plant operations. Indeck Power Equipment Company has the largest stock of boilers available for immediate shipment on a lease/rental/sale basis. Indeck also supplies auxiliary equipment and rental boilers to utilities, chemical processing, refineries, power plants, food processors and other industries. Indeck Boiler Corporation, the manufacturing member of the Indeck Group manufactures water tube boilers, thermal oxidizers, high temperature hot water generators, and firetube boilers. The Indeck Group of Companies is also the home to many of the most trusted boiler designs ever built including Erie City Iron Works, Zurn Energy, Aalborg land-based boilers, Indeck Boiler, Star fire, Thermoflo, Volcano and International Boiler Works (IBW). Manufactured boiler styles include “A”, “O”, “D”, Modular “D” type boilers along with the International LaMont® line of High Temperature Hot Water Generators, solid fuel boilers, waste heat boilers, I-HRSGs and Travagrate® Stoker. Indeck has the largest inventory of boilers available for sale, lease or rent. For additional information see www.indeck.com or www.indeck-keystone.com or email info@indeck-power.com or info@indeck-keystone.com. Indeck maintains a dedicated 24/7 emergency hotline for service, rental boilers, used boilers, or new boilers at 800-446-3325 to get plants up and running quickly.